Hope you are having a Pil-Easant Week! Today, I wish to share with you a Condition that has a debatable reputation with Pilates and that is….. Osteoporosis. Some people think that Pilates can do more harm than recovery. After doing a lot of research, I still think that correct application of the method along with the correct instructor will show results. In a human body, our bones are structures that keep on changing. Old bones are replaced by new bones just like the tissues in our body. 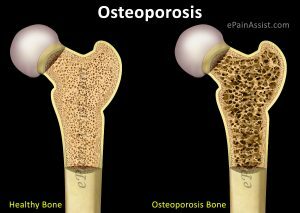 Osteoporosis is when there is significant bone loss or when there is less formation of new bones to replace the old bones. This eventually leads to weaknesses in the skeleton and overall body. People who are 50 & above are most vulnerable to this condition as bones start losing its’ density naturally with age. Pilates is safe for responding to Osteoporosis as well as preventing it. Different kinds of exercises need to be applied to those who have the condition versus those who are looking to prevent the condition. However, before doing any exercises, it is highly recommended to ensure that patients are guided by a professional Pilates instructor that has been trained for this condition. 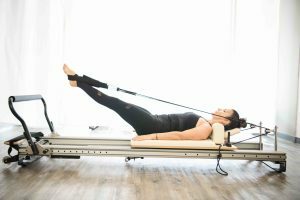 There are some Pilates exercises that need to be avoided if you have this condition, however, we should not rule out Pilates completely for addressing it. Pilates touches upon all 3 kinds of exercises through the method, the apparatus used as well as the practice. Complementing Pilates exercises with the Flexband Exerciser and/or the Pilates Circle adds flavor as well as additional resistance and weight! It is important to keep the bone moving as bone tissues tend to slow down! Prevention is better than cure, therefore, when you have the chance right now, add resistance and weights to your workouts and shock your bone with various speeds and directions for it to strengthen. Additional weightage to the bone can come from high impact exercises such as jumping, running, squats etc. It is also important for balance to be maintained as early signs of Osteoporosis is frequent falls and fractures which often comes from not being able to balance effectively. It is important not to think that every fall or fracture means it’s a definite case of Osteoporosis, however, it is also important to sustain the bone tissues before it weakens or softens with age. Pilates is the perfect platform to combine resistance, weight-bearing and balance exercises to strengthen the muscles, re-condition the body, correct any imbalances, correct posture and alignment through controlled movements. An ideal Pilates osteoporosis-prevention program should cover back (spinal, scapular stability with a heavy focus on the thoracic spine), wrist and hip strengthening. For good bones, you also need to nourish it with proper nutrients and minerals which comes with a healthy diet. All I can say is to ACT NOW before AGE Acts Ahead of You!